Having a firm grip on costs is quite important for most organizations. Excessive software costs coming from unnecessary renewals or over-compliance on expensive software can very easily stack up to large amounts. IT Managers who are looking for ways to reduce the IT expenses will quickly appreciate the insight Scense Software Metering will bring. 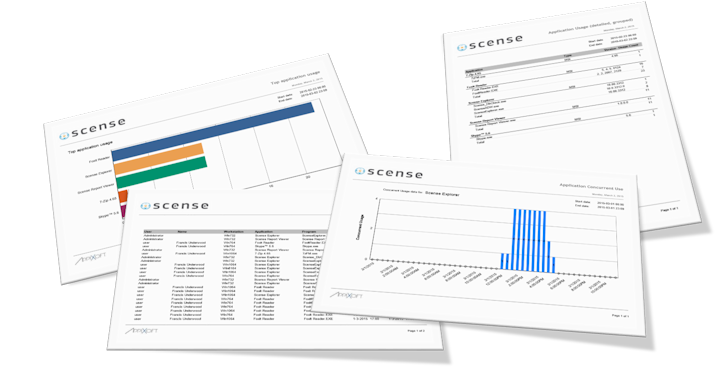 Scense Software Metering will track the usage of applications on all workstations and store this information in the central database from which clear and informative reports are generated. Scense comes with several preset reports that show application usage in several ways. Reports can be added and modified. "Scense helps us to use our IT more effectively." 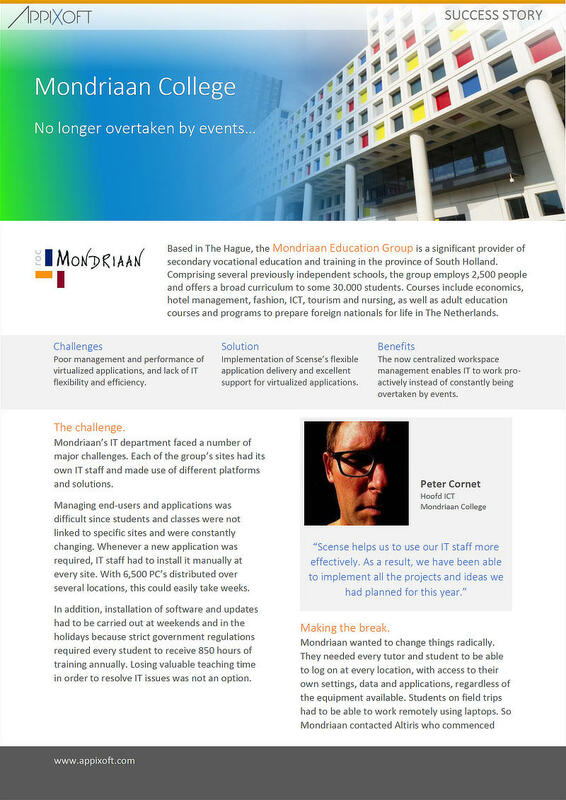 See how Mondriaan College improved IT with Scense Workspace Management . Unused- or underutilized applications cost just as much as any other application, in terms of license- and maintenance costs. Identify these applications to save time and money. To make sure you’re in compliance with your current software licenses, you can keep an eye on peak- and concurrent use of applications. If your software metering reports show the use of older, possibly less safe, application versions, you can act on this by consolidating to the newest version of such applications. With well targeted software metering, you will be able to create usage reports that help demonstrating how new software investments affect ROI. With Scense Explorer you can switch on software metering for individual applications. The software metering data flow is optimized for performance. Each step in the data collection mechanism is simple and fast by design. Raw data coming from the workstations is immediately stored in the database. Then the background consolidation process will take the raw data and turn it into structured presentable data. Some data needs extensive calculation before presentable data is available, like concurrent- or peak usage over a certain time span. That’s when the analysis process will take the structured data and generate new calculated data from it.